How accurate a clock do you really need, honestly? You’ll still probably show up late to parties and dial exactly three minutes late into every scheduled phone call. But scientists creating ultra-precise new atomic clocks don’t really have you in mind. Instead, they’re using wild physics to understand mysteries of the Universe that could alter time itself. A team of physicists lead by Sara Campbell at the National Institute of Standards and Technology used the weirdness of quantum mechanics to create the most precise atomic clock yet. This clock employs atoms vibrating in three dimensions, using laser light to trap them in a sort-of miniature modular Ikea bookcase where they count down the tiniest measurable time units. The clock could one day help scientists devise some mind-boggling experiments. “Developing a clock like this represents the most sensitive and inquisitive instruments mankind has built,” said Jun Ye, study author from the NIST told Gizmodo. “We want to use it to describe the connection between quantum mechanics,” the mathematics describing the smallest pieces of the universe, “and general relativity,” the theory describing gravity. Atomic clocks are just atoms that vibrate in a very special way in response to light. Electrons orbiting atoms arrange themselves in particular locations like single LEGO bricks on a big LEGO mat, with the preferred locations ordered by the energy required to move the electron there. 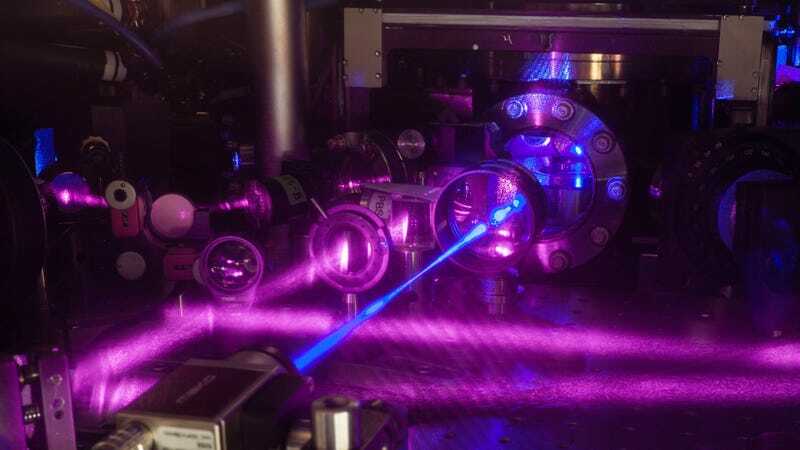 Incoming energy from a laser can snap the electron into a higher-energy position, and after a set amount of time it falls back and releases its own light. Clocks take advantage of the regular oscillations of this process and define units of time based on the total number of back-and-forth snaps. Scientists originally used microwaves to run these clocks, but are now moving to visible light which can potentially offer better accuracy and precision—there are more oscillations for a fixed amount of time, explained Ye. But researchers have dealt with some issues with these visible-light clocks. The more atoms they use, the more accurate a clock they can build in theory, but more atoms also introduces the chance for inter-atomic interactions that can undo those accuracy gains. Additionally, the signal from the vibrating atoms can get fuzzy. The NIST scientists report a new solution today in the journal Science. Older clocks constrained the atoms to one dimension but moving to three dimensions better separated the signal from the fuzziness. Using a special gas at hyper-cold temperatures allowed quantum mechanics’ rules to kick in on a larger scale. This amplified one specific property shared by the atoms in the gas, which reduced the interactions between them and helped make the clock more precise. The advance may soon allow researchers to build bigger clocks with as many atoms as they want. In short, the team took advantage of physics’ weirdness to make the most precise (but not the most accurate) atomic clock yet—and a scalable one. Ye thought it would be a long time until the National Institute of Standards and Technology adopts such a clock as the standard, given how much we rely on our existing clocks. But he, and everyone I spoke with, was more excited about the clocks’ potential for basic research. In a wristwatch, “you lose 1 second over a year,” explained Asimina Arvanitaki from The Perimeter Institute in Canada. But the new clock “loses one second not every year, but every age of the universe.” It’s important to note that the quantum mechanical effects fall apart after ten seconds—but this is something the team is currently working on, and is eons if you think about just how many times the atoms are vibrating per second. Super precise clocks like these can be used to probe never-before-seen physics. You may have heard of dark matter, the mysterious source of a majority of the Universe’s mass that scientists can only observe indirectly. Perhaps these hyper-precise clocks can be used as detectors, looking for the tiniest change in their vibration when dark matter passes by. Additionally, gravity changes the way clocks tick. Perhaps a clock based on this system could detect passing gravitational waves, allowing for tabletop detectors instead of several-kilometer-long ones. Naturally, there’s still work to do. Francesco Scazza from the European Laboratory for Non-Linear Spectroscopy explained (and Ye confirmed) that these clocks are precise, meaning there isn’t a lot of discrepancy between the ticks, but Ye’s team hasn’t tested the clocks for accuracy, how the ticking compares to the way the Universe itself ticks time. “Usually what they need to do is benchmark it with another clock,” said Scazza. Ye also told Gizmodo that there is still the potential for other accuracy-harming interactions between atoms, and ways to make the clock tick longer than ten seconds before collapsing out of the quantum mechanical system it was held in. The World&apos;s Most Accurate Clock. Ever.